Mojave was the perfect stop. You have great food, a grocery store, laundry and enough TV to realize that you aren’t missing much. There is even a bus that will take you back to the trail for one dollar! (Wish we would have known that earlier as we would have hiked the next 8 miles to Hwy 58, rather than hitch from Willow Springs road). The best part was our daughter was able to visit us (me) for an early Mother’s Day. We were able to catch up in person and get our dog fix in as she brought her two crazy canines with her. She helped us run a few errands and we ate an early dinner at one of the best BBQ joints I’ve been to since Redneck BBQ in Kingman Arizona. This was Red House BBQ in Tehachapi. 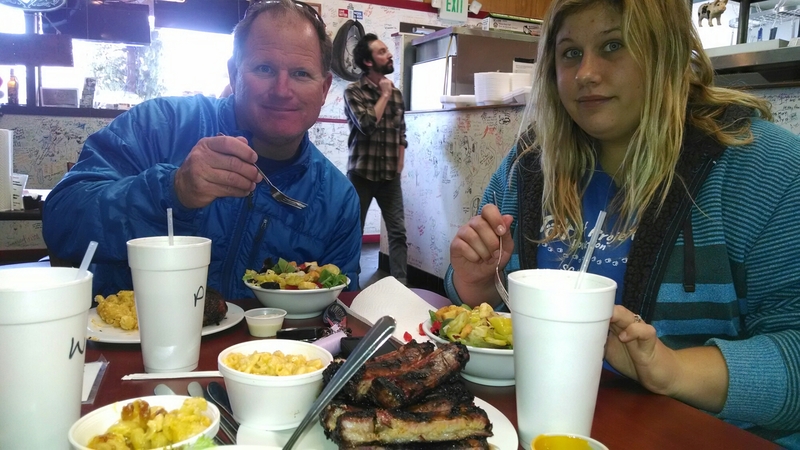 My daughter and I had ribs while Paul had chicken…all to die for and way too much to eat in one setting. We also got to write on the walls and sign our name. Paul wrote “2MoreMiles PCT 2014” on the wall just as you enter the front door. 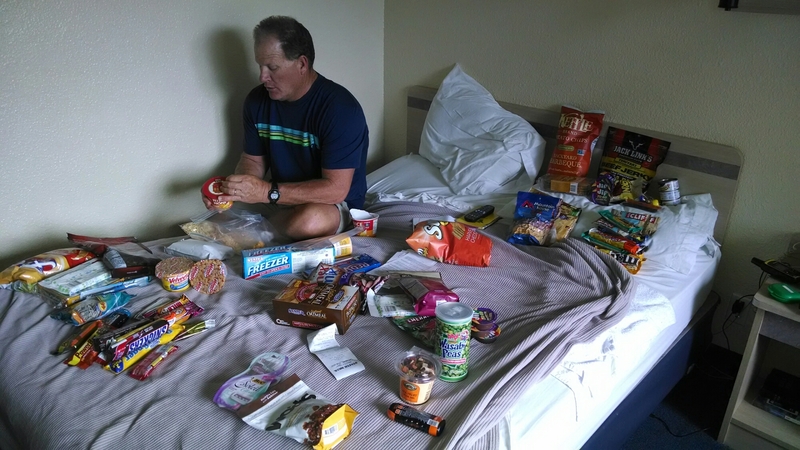 Sadly our daughter had to get going as she had work early the next day and we had to distribute our food resupply. Our timing into Mojave was also impeccable as there was a high wind warning in effect till 9am the next day. Blinding dust storms and gusty winds that would nearly knock you over started just as we arrived and continued throughout the day/night. Maybe it was just as well we didn’t know there was a bus from Hwy 58.